The White-backed Vulture, Gyps Africanus, is the most common vulture species in the Kruger Park. It is also the most common vulture in Africa. Guests who book our 5 and 6 day packages go to Moholoholo Rehabilitation Centre where they can interact with some rehabilitated White-backed vultures. In fact, for the really adventurous, there is an opportunity to have the vultures fly to your arm (suitably protected by an arm guard). 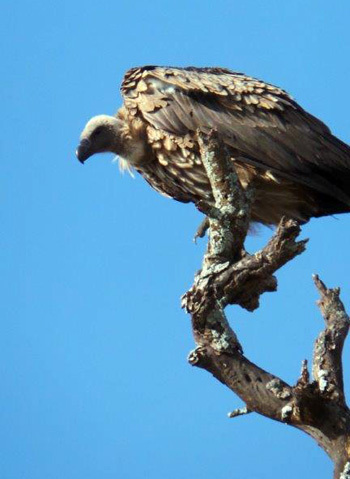 The guides at Moholoholo tell our guests that some of the locals poach Vultures. Ostensibly the reason is to sell the vultures’ eyes to witch doctors. There is a ridiculous belief that because the vulture has phenomenal eyesight, the human recipient of vulture eyes will be able to look into the future ! It is so irritating that people can be conned into believing this undiluted hogwash! Similarly, because of the prolonged mating sessions that rhinos have, it is believed that rhino horn can act as an aphrodisiac – hence the pitiful state of rhino numbers. We really need to educate our local population about the harmful myths that are propagated – once they understand how totally inaccurate these ideas are, the locals can help in protecting instead of poaching our threatened wildlife ! It was a very busy month. As usual at this time of the year we do volunteer programs in our neighbouring village, Acornhoek – and we help Funjwa primary school. We take our guests to do painting, planting vegetables and teaching in classrooms. We also visit orphanages and homes to help kids with their basic needs like food and clothes. The game viewing is excellent – we see the Big Five almost every day. The vegetation is very dry and animals are moving to the southern side of Kruger, where the vegetation is looking much better. I believe this year we will lose many animals because of the drought. We left early in the morning before the monkeys wake-up at Tremisana Lodge. It was very good day and very easy for us guides in terms of finding animals. We found the Big Five before lunch and had an interesting sighting of hyenas eating a small impala. Hyena near our open vehicle. All our sightings were along the Orpen-Satara road. Near the Rockvale pan we found two white rhinos drinking water. We found a dead giraffe further on – I think it died because it was old and sick. We continue on S36 towards S125 where we found eight Sable antelope feeding along the road some were sleeping nearby the road. It was one of my rarest sightings in Kruger Park !!!! Mitty High School from California came back again with 28 students and five teachers. They were here for safari and to do volunteer program. This year we painted a church, we also visited Funjwa for the second time. Our presence was highly appreciated by both the teachers and children. Later in the afternoon we went to an orphanage home where all of us played with orphans and help to serve the food and played football. Thabo, Mayneth and Lucky also played football. This year we lost, but Thabo soccer one goal. It was very cold morning and everyone was looking forward to seeing many animals and to learn more about the Bush. We were lucky with hippos along Olifants River because the water level is very low. 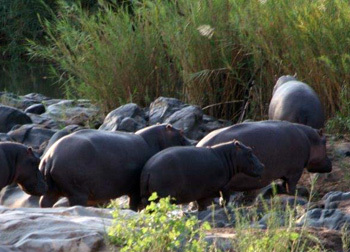 The hippos spend more time outside the water. It also common to find them feeding along the riverbank. The month of June has been a continuation of last month as the vegetation has deteriorated – still not enough grass and decreasing water supply. The hippopotamus are struggling to live with the shortage of grass. This month, I know of 5 hippos that died because of the nutritional crisis. Along the tar road from Orpen to Satara a hippo died and a pride of 4 lionesses and 5 cubs were present for 3 days. It was not a good area to hang around with a strong smell but because we wanted to see the cats we had no choice but to close our noses and get the necessary pics. Lion sightings have become so much simpler to get these days. Kumana dam has got lions every day; Mazithi dam much the same. There’s a pride of 23 which hang around Kumana dam with 7 cubs. They sometimes split up – some remain on S125 while others are at the water hole. 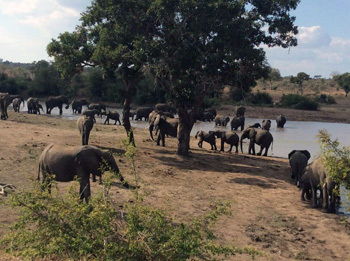 On one occasion as they were at the water, a breeding herd of elephants came from the bush. It was a herd of about 100. As they all moved down to the water,the lions were watching but they were then chased by the elephants and all fled into the bushes. Hippos, giraffe impalas and Buffaloes were also all drinking there. Elephant herd at Kumana Dam. We find leopard very frequently due to less thick bush – no place to hide for them – we found one near Kumana that had killed an impala next to the road. It was a male Impala that lasted for two days before the hyenas came in to finish it off. There is another leopard hanging around the Satara area that we have spotted regularly. Sightings around Tremisana Game Lodge have been great – on one morning a pride of lions at the lodge entrance held up the start of our morning walk ! The morning walks I have had with Tanya along the Olifants river have been outstanding as we viewed some hippos and crocodiles at a extremely close range. On one outstanding morning walk I had with my Polish guests, we had a sighting of two white rhinos – a male and a female. The female white rhino could sense our presence and attempted to charge us. We waited on top of a termite mound behind a Nyala tree so the animal couldn’t find us but she continued to be suspicious. We walked around the thick bushes attentively till we were at the vehicle. Everything was under control. We are seeing on a regular basis a big herd of buffaloes walking from the plains above the Olifants River to the spruit. Animals still continue to survive despite the terrible drought we are experiencing. A female cheetah is being seen along Maroela road during the walk activity. The full day drives in the Kruger National Park continue to be good. At Shimangwanini dam I had a wonderful sighting of a breeding herd of elephants with white rhinos. Elephant drink at dam while White Rhino wait patiently. Some other animal species including giraffes, warthogs, white back vultures and kudus are always seen in the area. Slowly and surely the dam is drying out. We are seeing lions every day around Kumana and Mazithi dams. It looks like a mega pride is controlling both water points. On the 2nd June I conducted a full day safari in the Kruger National Park. The wind was strong and chilly. With blankets on and eyes on the lookout for animals, we managed to spot all the Big Five. We found lions down south at Kumana dam – a great place to find lions. They often camp out not far from the water hole, waiting for unsuspecting visitors to drink water- it’s a cruel world out in the wild. Today the lions were joined by a large herd of elephants, enjoying what remained of the water. The herd moved with purpose, clearly not amused by the presence of lions at their water hole. The elephants weren’t the only ones looking for water, the buffalo slowly moved closer and closer to the water’s edge, then turned around in haste as soon as they picked up the scent of the lions. There have been numerous Buffalo kills at Kumana and Mazithi. 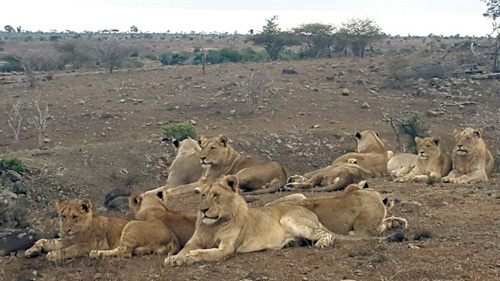 The action was just great – it was now time to continue our search for the Big Five en route to Satara. It wasn’t long before we found ourselves enjoying yet another sighting of a member of the big five. This time it was our good friends the White Rhinos. Standing out in the open, enjoying what grass still remained after a dry summer, the four of them slowly moved along like big lawn mowers, chomping away at the grass. The rhino where great to see, always a pleasure. The day was about to get even better as not much further on we noticed a few cars stopped all facing a similar direction. We slowly approached, hoping it was the 5th member of the big five. The leopard, there it was hanging across a branch at full length. Leopards are the one cat that enjoy trees the most, often using them to catch a nap or keep their dinner out of reach of other predators. It’s back into the Kruger on the 4th, a new day and a new challenge. This time the first thing we see is a leopard, stalking impala. After a start like this you just know it’s going to be an excellent day. We made our way along the tar towards Nsemani dam where we were hoping to find lions. A passerby had informed us earlier about a pride of lazy lions sleeping at the dam. On arrival we first spotted a pod of hippos lazing about in the shallows, enjoying the winter sun. In was a little further along that we ticked off our second big cat of the day, not just one but a whole pride of 9 lions. They just lay there sunning themselves in the morning sun, to ease the winter chill. After a delicious lunch at Satara rest camp we headed north in search of the remaining Big Five. The road along the Timabavati river proved to be great, with herds of elephants moving through the dry river bed. The buffalos emerged late in the day, crossing the main road heading towards the Timbavati river for a drink. It was a great day full of sightings, unfortunately the rhinos didn’t make an appearance. It’s the 12th June and I’m back in the Kruger. It’s a beautiful sunny day and we’re on the search again. While heading along the H12 towards Satara, we come across an array of different antelope and general game. The giraffes keep popping out from the trees to see what we are up to, very inquisitive animals. The Timbavati river then provides us with an excellent lioness sighting, three of them lying in the sand soaking up the warm sunlight. 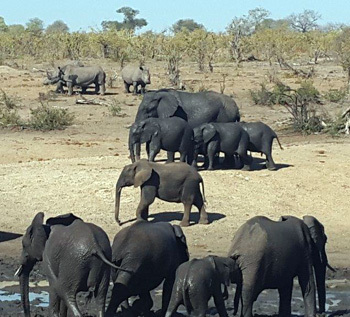 They placed themselves at a strategic spot looking onto a very popular water hole, which is usually frequently visited by an array of animals – today however no one is brave enough to venture in for a drink. We head south towards Shimangwanini dam, which rewards us with a few big male buffalo, wallowing in the shallows. A herd of elephants then come to join the party, spraying water all over themselves and each other. The road continued with a few more elephant sightings and then exactly what we needed – a leopard sighting. Leopards often prey on warthogs; they are simply packed with meat. The leopard we found was still feeding off the remains of a warthog, tearing away at the flesh. The rhinos were saved for last and what a great way to end a great day out, with a mother white rhino and her calf. The month of June has brought the chilly winter air – the reserve remains dry with animals frequenting the water holes and river to find the last few remaining water sources. The Olifants River has reached very low levels, with only a few stretches deep enough to keep the Hippos happy. During morning bushwalks, we have been making our way along the Olifants river bank, with a few good sightings of hippos in the water. Hippos are very comfortable in the water hence they spend majority of their time blobbing about in the water, protecting their sensitive skin from the sun. The water is also home to some large crocodiles, we enjoyed a few great sightings of these prehistoric beasts – we saw a five-metre long female sunning herself on the banks of the river. The Black Rhinos have also been seen along the route to the bushwalk, with a great sighting of a male with his female and calf. Always a great thing to see and one of the rarer sightings. The elephants are always exciting to see on foot – we managed to approach a big bull elephant without it noticing our presence. They are always so much bigger when seen from ground level. The Sundowner Drives have been packed with general game, as well as some excellent elephant sightings – we have a few favourite elephants on the reserve. The most beautiful to see is our largest male called Ezulwini – he towers above the vehicle and has a pair of magnificent tusks. The Sunset Drives have been great for the night animals, with a few good hyena sightings, and as we get closer to our dinner spot at Marula Boma we have often come across herds of elephants moving through with their young calves. The young calves often mock charge the vehicle, something they must have learnt from their parents. Dinner is always a beautiful part of the evening, under a star filled sky listening to all the night noises, which are often the sound of lions can be heard close by. The buffalo have also been on the move, often seen in the late evening moving across the road heading towards the nearest water hole. Buffalo are highly dependent on water and can often be seen in the early morning and late evening, moving towards the water hole. Morning drive has been very, very interesting this month, seeing a cheetah on almost every drive, but to keep things exciting we also get the elephants showing up now and then. Beautiful sunrise is very much appreciated – seeing as it is so cold the last few days so warming up in the sun is even better than ever. Afternoon cooling down makes for an amazing sighting time of day. We got to see so many Elephants, Buffalo, Giraffe, Cheetah, Hippos, Crocodiles and Zebra. Giving my guests a fun drive with so many different animals. I had the best experience of my life, During a Sunset Drive, we got 2 big male lions right next to our open vehicle showing off their amazing vocal abilities – giving not just my guests but myself goose bumps. It made me feel even more grateful for being able to do the job that I do. 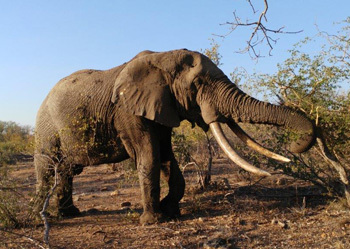 During dinner at Marula Boma we had a problem with an elephant who wanted to eat the massive Marula tree that we were sitting under – with a lot of faith and a bit of fear I managed to move him off and get my guests safely into the vehicle. This month has produced some really exciting sightings. Kruger as always never lets me down. The elephant sightings have been exceptional and exciting. On most of the drives in Kruger we saw at least one really great male elephant sighting up close. On one occasion I had a great sighting of an elephant bull in musth that just decided to fall asleep in front of our vehicle in the road while standing. It was exceptional as he did not even care about all the other vehicles around him. He blocked the road for quite a long time and the traffic was building, until eventually he woke up and decided to continue feeding. Then on another drive we got an awesome sighting of a bull elephant busy playing and having a ball in a water hole near the road. He was splashing and throwing his weight around and showing us how much fun he was having. It was almost as if he was doing it to impress us – what a great sighting. This month the Leopards have been quite shy but still very exciting. One evening after the Sunset Drive at Tremisana I was informed about a leopard near Tremisana lodge that had been spotted. I managed to get the guests and off we went looking for the leopard and eventually we got her. She gave us a real run around she was hunting and found some guinea fowl in a tree and started stalking up the tree and just missed the kill then we followed her off road and got her again. That was really exciting. On one of the days in Kruger we had an exceptional sighting for the first time of a leopard making a kill. A very young male leopard was stalking impala behind the rocks and eventually he got close enough and managed to catch one. It was so exciting – it was my first ever leopard kill. Yay !!! The lions have been quite awesome this month as well. On several different days we got the same pride of lions in a similar area in Kruger. This pride is 24 strong of which 10 are cubs, with femals and multiple adult males. On one of the sightings they had killed a nice big buffalo near a dam where they had eaten most of it already and while we were watching them, on the other side of the road, 2 of the lions decided to start mating in front of us which is quite a rare sighting as it only lasts a few seconds. 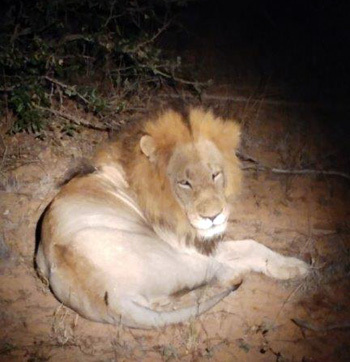 On all of the Kruger drives we managed to get at least one lion so they are quite plentiful now during the drought. On one of the Sunset Drives, it was really quiet and we didn’t see much at all until eventually at the end at the bush braai (BBQ) I managed to find the lions right next to the road – 2 males and 2 females. They just sat there and relaxed until eventually one got up and moved off and then started calling and the others soon after followed. It was awesome because it was less than 100m from where we were eating dinner at Marula Boma. Lion seen during Night Drive after dinner. On a lot of the Sunset Drives we often get some awesome sightings of some welcome visitors at the Marula Boma while we are eating dinner. On one of the nights we got a nice sighting of 3 hyenas that got quite curious and started coming quite close which was nice to see them. On several Sunset Drives we often get porcupines, hyenas, civet, elephant and many other animals that came to investigate while we were eating dinner which was quite awesome. Lately we have been quite lucky with a cheetah that has been in the area. On one of the sightings she managed to chase an impala right into the fence of a neighbouring reserve. She managed to get through the fence and pulled the impala through as well and then killed it and started feeding on the other side of the fence. She seems to still be there and hopefully will come back to our side soon. It has been a fantastic month with brilliant sightings. Personally one of my best ever months of game viewing so far because it has really been surprising and action packed. The cold winter chill this month on morning drives has often been made worthwhile with some great sightings of many different animals. In particular the elephants and the beautiful female cheetah in the area that I have been privileged to see very often this month. The cheetah has been very active this month since the lions have become more scarce. The Afternoon Drives this month have been very memorable with beautiful close elephant sightings on 5 occasions and once with the elephants drinking water from the Olifants River. 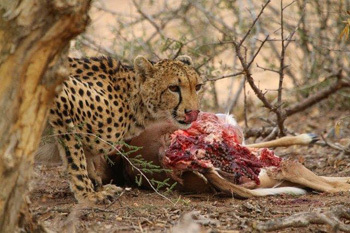 Also saw the cheetah on an impala kill on Campfire then again when we heard about another impala kill just down the road from Tremisana Lodge, 2 other times I had the cheetah walking along the fence line of Olifants Road. One drive was the so busy with sightings that were just stunning, all starting with a mother giraffe with a baby that was only a couple of days old and still unstable on its feet. Shortly after that I had a beautiful female leopard that crossed the road in front me then into thick bush. Just to make the drive even better there was herd of 8 elephants that walked past right next to the game viewer. Buffaloes have also been active this month on drives from the old daga boys to a huge herd of several hundred. Had some good Bushwalks with the best being the morning when I was with Phillip and I decided to drive deep into the Tremisana property where we saw a pride of 10 lions. On other Bushwalks we had sightings of elephants, a massive herd of buffaloes and other general plains game. During the walks we had lots of buffalo encounters. Along the river we always see hippos. There have been elephants on a number of occasions as well as buffaloes during dinner and the usual visitors, the hyena and porcupine. On the one drive back from Boma as we went past the Lapa waterhole of Tremisana there was a female leopard that ran across the road in front of us. Licking her lips after the good meal. I am a new guide at Viva Safaris. I am based at Marc’s Treehouse Lodge. The first few days I spent getting to know the routes in Kruger National park and Moholoholo and Tshukudu. I went into Kruger with Mayneth who showed me around and also told me a lot about the surrounding places and history of the park. Most of the times we saw the big 5 and then most of the plains game. We went looking for animals near Kumana dam after taking the S36 that joins up with the S125. We found lions at Kumana dam a few times in a row and a leopard next to the tar road lying behind a bush. The people at Marc’s camp were very welcoming and Victor did his best to make me feel at home. It was the first time for me to go to Moholoholo and I enjoyed the tour – it is very educational. The more I went on the tour the more I enjoyed the guests’ reaction to the information and pictures that they see. They initially find it sad but leave knowing the good and the bad and hopefully more willing to take part in conservation, not only here but where they are from as well. As I was still waiting for my DEAT certificate I could not conduct tours in Kruger National Park yet but it gave me some time to learn the routes. I received my certification on Tuesday so I was able to start taking groups into Kruger by myself. The first time I went in convoy with Patrick where we didn’t see much for the better part of the morning. We got an update of lions on the S100 and went to see them. Before that we found Elephants almost everywhere. After seeing the lions we went for lunch. The Vehicle was rather full and I had a father and a son from Singapore that really wanted to see hyenas. A gentleman at Satara showed me a photo of hyenas and told me they weren’t far off – about 1.2 km north of Satara. We found them right next to the road and the guests were beaming. 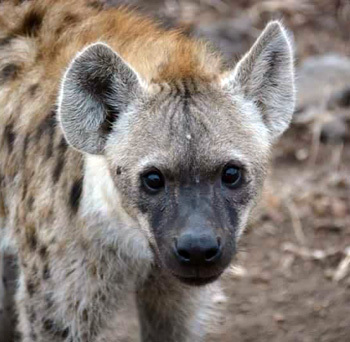 A teenage hyena came to inspect and put his front paws on the vehicles steps in attempt to climb up. He went around and started nibbling on the tyres so I tried to get him away from the vehicle. On the way back we encountered a big Elephant bull that was not too happy with the fact that we were that close and gave us a little warning charge. On a different tour we found a leopard next to the road near an impala she killed south of Kumana dam. Lions stay permanently in the area of Kumana dam so we found them there. One night on my way from my room at Marc’s I walked into a Aardvark casually passing by the lamp lit road, I couldn’t believe my eyes, by the time I got the guests he had disappeared into the bush. One of the latest trips I have done went extremely well. We found Rhinos before Orpen gate lying down behind the bushes about 30m in. The weather was sunny so all of the Elephants were in the waterholes cooling down. Before lunch we had seen 4 of the big 5. The leopard was in a tree about 6 km before Satara with her kill. The guests wanted to hurry with lunch to see more animals so half an hour later we were heading out again. I got an update that the lions were near Girivana dam. On the way there a spotted hyena was casually lying 20m in about 1km before the dam. 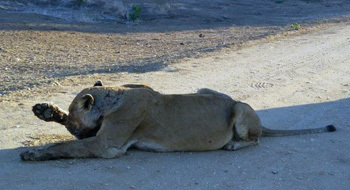 When we arrived there were 3 lionesses, one of them lying in the road. She appeared to have a bad case of mange but when I reported it to the head ranger he said that the park cannot interfere. The past few days the camp has been a bit quieter so on the days I had little to do I helped Victor stock and clean the bar and sort out and receive orders. It has been harder to find animals due to the cold weather so the mornings are quiet as opposed to the afternoons when all the animals appear. Over the weeks I have been helping out with hosting, receiving guests and taking them to their rooms, helping out in the bar etc. They only thing about this job that I find increasingly difficult is the fact that I meet so many different and amazing people that I have to say goodbye to after a few days. I feel like I am losing friends. The winter chill has certainly found its way to Balule Olifants West, making blankets essential on morning drives. The animal sightings have been great, the best of recent being a female cheetah. We have managed to spot her on several occasions, the best one being an impala kill not far from Tremisana lodge. The lions have been very vocal, in the early hours of the morning, often calling each other after their late night activities. We have even had the pleasure of spotting them not far off from Tremisana lodge, the whole pride except for the male, was seen moving along the main fence line after having a drink at Tremisana dam. The buffalo herds have been seen from the breakfast area, moving through after spending the night near the lodge. We managed to get a few shots of them drinking on our camera trap, now that the water holes around the lodge are so low; our water hole has become a prime spot. The beginning of this month saw an exciting big of action just near the lodge, on the way back from a sunset drive, the guide managed to spot a leopard, moving off from our water hole. This was highly exciting to have such a shy cat so close to the lodge. The elephants often make their way towards the lodge, most often heard at night having an evening drink, then moving off on their way to find some food. The Sunset Drives have been highlighted with elephant sightings and the sound of lions calling during the Marula Boma dinner, often in chorus with hyenas. The feel of the African bush is truly felt on nights like these and even more so by the star studded sky, shimmering with brightness. The local monkey inhabitants are always up to mischief, hanging around in the trees waiting for an opportunity to find some food. The youngsters are often being disciplined by the dominant male, it’s always easy to tell which one’s in trouble. The naughty youngster always finds a relatively safe spot to hide and waits for the big male to lose interest. It only takes a nice piece of fruit or something edible to capture his attention. The Kruger National Park has been a very successful hunting ground for the Big Five, with the vast majority of guests coming back having seen all of these exciting animals. The lion and elephant sightings being constant 100% with a few excellent close up leopard sightings. We are definitely feeling winter with very cool evenings and chilly mornings. Unfortunately our surrounds are still very dry, however the Klaserie River, in front of the treehouses, Is still flowing, providing our animals with water. Our nightly fires are attracting our clients like moths to a light, with many deciding to have their meals right by the fireside. There have been two sightings of an Aardvark (Anteater} near our camp, plus a few Porcupines, as well as the numerous Nyalas which regard the camp as theirs. We are happy to report that we still have a good turnover of clients, even though this is meant to be our quieter season. Katekani is rapidly gathering steam and is being enjoyed by our international guests. Our main personal satisfaction derives from the incredulous looks of disbelief we notice when guests are shown to their tents. The one American guest actually started weeping in disbelief at the size of her tent, and was sooo happy to see that she even had a flush toilet. Last Monday night at sunset there was a Leopard just outside our fence on the main road, seen by our staff, notoriously difficult to see usually. The bush is still very dry and all the animals must be taking strain to keep themselves alive, never mind fed. It is great that Viva Safaris guests are seeing so much but there is a sadness in the bush. We are sad that the drought is causing such hardships to our precious animals. Our guests are glad to be experiencing so many wonderful animal sightings but they too are aware of the tremendously hard times the prey animals are experiencing. Our guides have an easy job in finding lions – simply drive to Kumana and Mazithi dams and there they are ! The guides are pleased that they can show the guests so much but they too feel so sad. It is a trying time and we hope and pray that the rains will fall by early September – until then we can only hope that the death figures of our precious animals is not too drastic ! 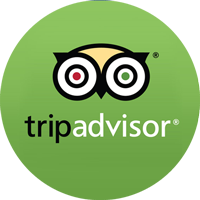 I include the following reviews posted in June 2016 on Tripadvisor. It is good to be getting reviews in so many different languages. What an amazing place to be … I was treated like a queen. I felt welcome and at home as soon as I arrived and was greeted by Alan and Alana…. They couldn’t have done more…. the accommodation was great and lovely Margeth and Gertrude kept it really clean and tidy for me and spoilt me by putting a hot water bottle in my bed every night. The food was SO SO good … far too much for me to eat and all served up in a lovely friendly setting. On the safari we saw and heard 2 male lions … so close 🙂 2 giraffes fighting, Cheetahs, Rhino’s Buffalos…. the list goes on … all the guides were so amazing and spotted animals that took me a while to see after they had stopped and pointed them out to me… the whole trip was amazing … not one complaint … worth every penny …. or rand!!! This is the holiday to choose … go for it! Abbiamo prenotato con Viva Safaris un safari di 4 giorni e il secondo giorno siamo stati alloggiati presso il KATEKANI in una cd. “tenda”, in realtà un dimora estremamente curata nei dettagli, spaziosa, dotata di tutti i comfort. La struttura è nuova e lo staff è semplicemente de-li-zio-so. I manager Alan e Elena sono due persone piacevolissime oltre che molto professionali, discrete e disponibili, lo staff di servizio in cucina Gertrude e Magreth preparano pietanze africane ma anche internazionali, con cura e passione. La tavola è sempre apparecchiata in modo diverso con grande creatività e amore .. Il lodge si trova a due passi dalla riserva di KAPAMA, bellissima, in cui è organizzato un game drive pomeridiano con aperitivo al tramonto (la riserva è bellissima e abbiamo visto lì il leopardo e le iene a caccia!) L’esperienza con Viva Safaris in generale è stata molto positiva per l’efficienza organizzativa, la professionalità, la competenza e lo spirito di tutte le persone che ci lavorano. 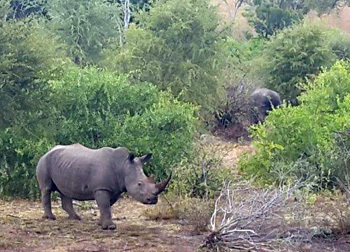 Le passeggiate nel bush, con i racconti e le informazioni fornite dai rangers e i game drive per avvistare gli animali sono esperienze davvero uniche! L’unica nota dolente nel nostro caso è stata la notte trascorsa al Tremisana Lodge, in cui la Guest House era invasa da vapori di qualche sostanza isolante o vernice che hanno reso la notte davvero spiacevole ma probabilmente si tratta di un problema transitorio! Een safari kost al gauw een hoop geld. Gelukkig kun je een korte safari bij Tremisana lodge inclusief een transfer van en naar Johannesburg voor een zeer redelijke prijs boeken! Tremisana is populair bij alle leeftijden en ligt midden in het Balule Game Reserve. De olifanten stonden bij ons voor het raam! Ich war für eine 5 Tages Safari in der Lodge untergebracht. Die Zimmer sind zwar nicht groß aber sauber und zweckmäßig eingerichtet. Kostenloses WLAN ist beim Haupthaus verfügbar und funktioniert – ausser wenn die ganze Lodge auf einmal ins Internet möchte – sehr gut. Das Personal um Pretty ist durchwegs freundlich, hilfsbereit und steht einem jederzeit zur Verfügung. Die angebotenen Safaris sind abwechslungsreich, die Guides ausnahmslos gut und darum bemüht den Besuchern soviel wie möglich der wunderbaren Natur Südafrikas zu zeigen. Das Essen in der Lodge ist reichhaltig, sehr gut zubereitet und hat ausnahmslos gut geschmeckt. My friend and I booked a 6 day Treehouse safari with Viva Safaris, 4 nights were at Marc’s, and it really couldn’t have gone better. I travel often and have high standards with multi-day tour packages and they really deserve credit. The treehouse itself was awesome. I had the tallest one (10m high). Wi-Fi, if you need it. I was never bored or felt like my time was wasted. The days were well spent. I can’t understate how phenomenal of a trip it was. Would recommend to my family, so that’s saying a lot.